What the newspapers are saying . . .
A few words from Sue . . . 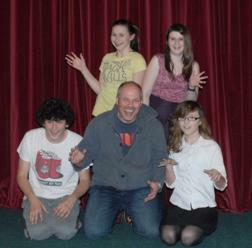 I have been helping John the past year with his Drama and Theatre Academy in Hunstanton. It’s been great fun and lovely to see our students enjoying them- selves and developing their talents so quickly. They all get along with each other and have made new friends. There is such a strong feeling of excitement and positively when they turn up on a Saturday morning and that time appears to just fly by. It was a sheer pleasure to see our first performances this summer and rehearsals are now taking place for our next shows. I look forward to seeing many more. I definitely recommend JGDATA the confidence and encouragement John gives to others is exceptional. 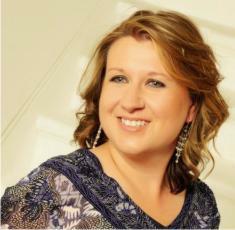 Hunstanton Pantomime Costume and Props designer. A few words from Carol . . .
John is an experienced professional with an inspirational and fun approach. He has a wide knowledge of all aspects of theatre, as anyone who has seen the Hunstanton Pantomime can testify! Through many years of working with children of all ages he understands how to get the best out of each student, and gears his work with them to build on their strengths. This enables them to acquire greater confidence and self-belief which they can draw on to help them in all their activities, as well as allowing them to perform in front of others to the best of their ability. On behalf of the Town Council, I am delighted to support JGDATA as a valuable addition to Hunstanton's educational and social amenities for our youngsters. We are proud to be the only Drama and Theatre Academy in West Norfolk for the Norfolk Children's University. This is our proof of outstanding excellence in educational provision. Here are what the news papers are saying about JGDATA . 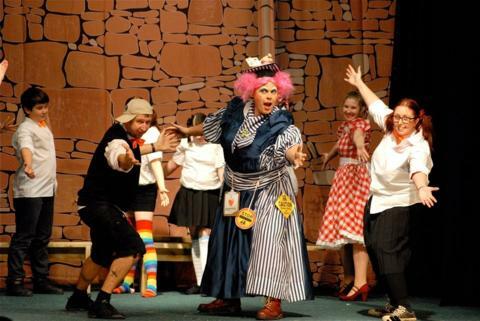 . .
John Giller as Dame Dotty Pickles the School Ma'am, with dancers Phil and Louise Lance. With its customary blend of humour, music, dance, colourful costumes and magical scenery, Hunstanton’s third annual pantomime proved as popular as ever with locals and visitors alike. In fact, 1,200 tickets were sold for the six performances between Christmas and the New Year. At the final show there was even a party of 27 visitors from North London, who were staying at the town’s Youth Hostel for four nights over the New Year period. Noel Kelly, his wife Sarah and their three children Sam 14, Florence 12 and Frankie 7 from Crouch End were full of praise for the professional quality of the show. After the show panto dame, John Giller, paid tribute to the cast and crew. “Although I write and direct the show,” he said, “and my name is on top of the posters, the show is only as good as it is because of everyone’s hard work, great skill and dedication. I am very lucky to be working with such a truly magical panto family. 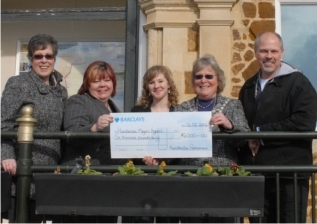 HUNSTANTON’S pantomime proved a success, artistically, critically and also, crucially, financially as a cheque presented to the town’s mayor proves. The Hunstanton Festival Players presented The magical Puss in Boots, written by John Giller, at Hunstanton Town Hall.The show played to packed houses and also benefited from the generosity of sponsors and advertisers.It was agreed that the profits from the 2011 pantomime would be donated to the mayor’s appeal for the refurbishment of the town hall basement, especially the kitchen. As a result, last month a cheque for £6,000 was presented to mayor, Carol Bower. It is generally agreed that the presence of a whale on the beach at Old Hunstanton gave a much-needed boost to trade over the Christmas and New Year holiday. Not for the first time, John Giller has come up with the perfect answer. Having swept me off my feet as Widow Hood in Robin Hood Norfolk Style; and turned in an equally good performance as Dame Kitty Litter in The Magical Puss in Boots; he is all set to stage a pantomime with a starring role for a whale! Yes, this year, between Christmas and New Year, the Festival Players will be staging John Giller’s production of Pinocchio in the magnificent Town Hall. Audiences will not even have to get their feet wet to see this whale and the show will be free of the smell given off by a decomposing mammal! Auditions will be held later in the year. Although we can expect to see some familiar faces in Pinocchio, John is well on the way to developing new talent in the refurbished Town Hall basement. Here, he is offering courses for all ages in the “John Giller Drama And Theatre Academy” – alternatively, JGDATA for short. We all know John to be a talented writer, director and actor, but first and foremost he is a highly qualified teacher with an MA and a BEd Honours Degree to his name. Therefore, all his courses for young people are designed and created with child development at their core, using drama, singing and stage techniques to build greater confidence; improve concentration; develop social skills and encourage creativity. If you want to add your thoughts to this list, send your comment to John via email, twitter or facebook . . .
My son joined JGDATA Shooting Stars, which have just performed their Circus Show. Lewis enjoys the sessions with John, he thoroughly enjoys working with him and the group. My son is developing his confidence by being able to work with other children and stand up in front of a crowd and complete a performance. I go to JGDATA and I LOVE it. It is worth every penny. John is a really nice man with a nice sense of humor! And everyone is treated the same. My daughter is enjoying all the different activities every week at Hunstanton. She feels comfortable as the class size isn't too large and overwhelming and all of the children get on very well together. I think John offers good value for money, and my child is learning whilst having fun! Brilliant, great, JGDATA could not have a better teacher to bring self confidence to children in our community. My daughter loves to attend the group and has learnt valuable and rewarding lessons which I am sure will remain with her for the rest of her life. We as a community need to support John Giller Drama and Theatre Academy to keep the love of theatre within Hunstanton. My children are both students at JGDATA and both enjoy it so much. With John's experience and knowledge, I know that they will both succeed. I think that JGDATA is the best drama and theatre school in Norfolk. The academy offers so much for the young people and should be taken with great interest. My two youngest children attend John's Saturday morning sessions in hunstanton and they throughly enjoy every second. Their confidence and self belief continue to grow and flourish with every session. The performances help them to develop fantastic story telling skills and re-capture the fun of playing make believe often lost in todays world of electronic games. Their social awareness and public speaking confidence are a real bonus and we have never encountered negative feedback. It's a positive environment for children and adults of all ages. A few words from Kate . . . This is my third year of working as part of a team to put on Hunstanton's very own Pantomime; written, directed by and starring John Giller as the Dame, and I just know the whole process is going to be both magical and side-splittingly funny. It is a privilege to be part of John's crew working towards what I know will be yet another sell out show. John's love for the theatre in all its forms is infectious. He is a gifted actor, writer and comedian, but above all, he is an inspirational and generous teacher. 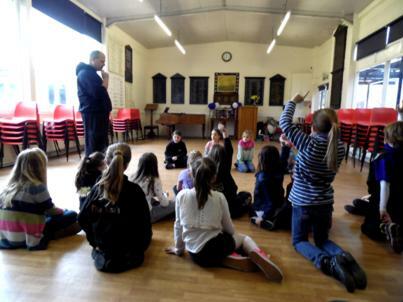 John's classes are never dull, always fun and focussed on enabling children to embrace spontaneity, create and engage with imaginative worlds, and through collective performance develop crucial real life skills, and who knows where that will lead…………?